ebook versions are keyword searchable! Because ebook are easily updateable, we can provide beta access to select titles as works-in-progress. You get early access to critical information (such as Ruby on Rails, which is a rapidly evolving platform) in return for providing feedback to authors. You can get personally involved in the publishing process. Here’s an example of how this process works. To begin, an e-mail message arrives to let you know an updated version of your book is available (you can also get this information via RSS). 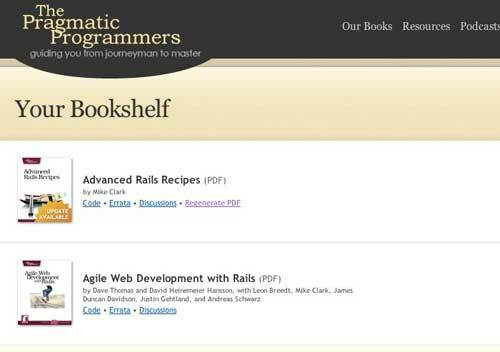 Looking at your virtual bookshelf, you’ll see that one of your books (Advanced Rails Recipes) has an update available. 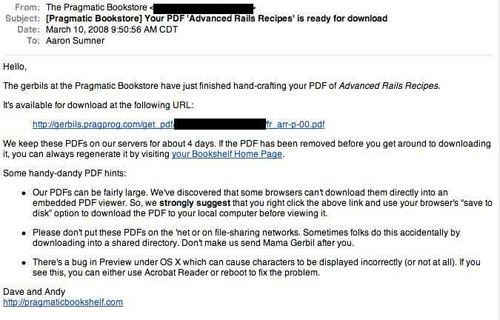 All you need to do is regenerate the ebooks, and our servers get to work. In a few minutes, you’ll receive another e-mail. 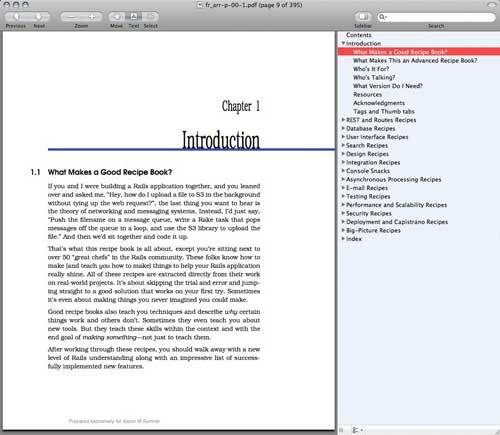 This one contains a unique link to your copy of the updated ebook version of the book. If you find a problem in the beta book, you can quickly submit it for consideration, or look up corrections submitted by others. 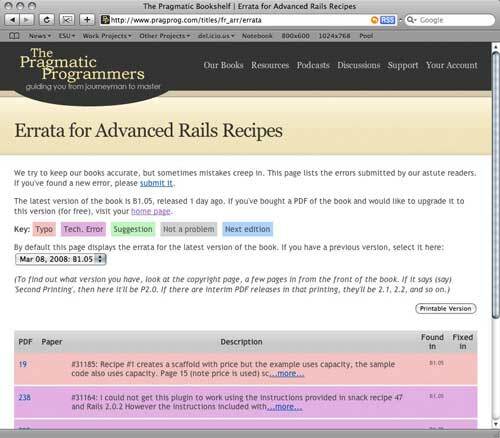 For all of the Pragmatic Programmer’s books, you can order the paper version just as easily (you can even order the paper and ebook versions as a combo for a few dollars more). You get access to cutting edge material, and can even give feedback on the book itself if you want. Best of all, you can have an entire reference library on your laptop—no trips to the chiropractor required.